Second wave. First aircraft to attack Sorpe Dam. Mine dropped successfully but failed to breach dam. Returned to base. Ronald Batson was born on 5 December 1920 in Ferryhill, Co Durham, the older son of Joseph and Elizabeth Batson. He was a grocer’s assistant before enlisting in the RAF in March 1941. After qualifying as an air gunner, he was posted to 106 Squadron Conversion Flight in early September 1942. He quickly teamed up with Joe McCarthy whose logbook confirms that Batson and Bill Radcliffe first flew with him on the same day, 11 September 1942, in a Manchester on a training flight. Their first operation was on 5 October. Batson was the only one of McCarthy’s crew to fly on every single operation in 97 Squadron with his skipper. By late March 1943, they had amassed 31 trips. On the Dams Raid, Batson was in the front turret of AJ-T. On the way back from the Sorpe, he spotted a goods train and asked McCarthy’s permission to attack it. The crew hadn’t realised, however, that this wasn’t an ordinary goods train but an armoured flak train, whose gunners responded with vigour. It was probably a shell from this which punctured a front tyre, and caused a problem a few hours later when landing at Scampton. BATSON, Ronald. 1045069 Flight Sergeant, No 617 Sqn. Sorties 37. Flying Hours 264.30. Air Gunner. 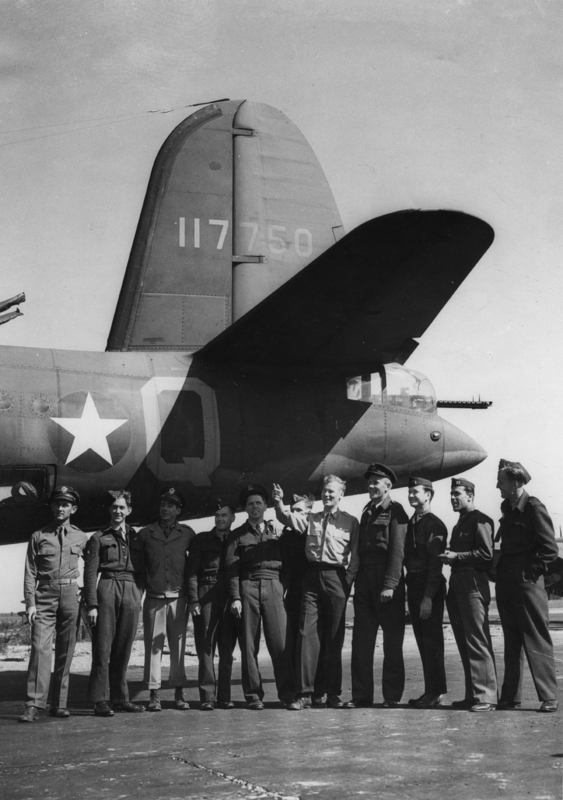 By the time the McCarthy crew came off operations in July 1944, Batson had reached the rank of Warrant Officer and had completed more than 60 sorties. He was posted to a training unit for the remainder of the war. Ronald Batson had one brother, Douglas, who also volunteered for the RAF. He was killed in a freak accident on 23 August 1944, when a USAAF B24 Liberator bomber crashed into a cafe in Freckleton, Lancashire. He is buried in Duncombe Cemetery, Ferryhill, Co Durham. How ironic that one brother flew on more than 60 operations over occupied territory and survived, while the other died while eating in a Lancashire snack bar. After the war Ronald Batson returned to Durham, and he died there on 25 November 2006. Thanks to Kevin Bending for help with this article. Survived war. Died 25 November 2006. Thank you for this – I have just sent the link to my mum, who was his niece. He was my Great Uncle, so it really good to read more information. Hi Amanda – Vera was my grandmother, her daughter being my mum (so Ron’s niece). My mum was very close to Ron, so would have some detail of various things. Are you related too then? I’m sure she’d love to see the letter you have – not sure how we’d go about getting in contact outside this without posting email addresses to be honest. Amanda, I’m Veronica Watson – Dan’s mum, and Ronnie’s niece (I never called him Ron, nor did I ever call him uncle! He didn’t want me to). I so wish that I had managed to get on to this site and give you more information about him before your mother died. But at least you were able to tell her something before she passed away. Ronnie was the best uncle anyone could have, and throughout his life he and I had a very special relationship. He was always on my side, always looking out for me. He hated it if I was unhappy and would go out of his way to help cheer me up. He was a stalwart member of our family, and was always on hand to help out or give support through difficult times we all experienced. He was a very private person, and it was almost impossible to get him to talk about the war. Nonetheless, I did manage to learn quite a bit about the Dambusters raid and I have a copy of Guy Gibson’s book ‘Enemy Coast Ahead’. If you are interested in learning more about him I would be happy to make contact – perhaps by email. I would also love to learn more about the letters you have, especially the one(s) you have from my mother.